Moving goods and people on the goldfields. This tour will take you to 8 stops from the Railway Station precinct to the edge of the historic central business area - if you are walking from town to the station run through the tour stops in reverse order. As you walk along these charming country pathways you will be following in the footsteps of many past travellers. Allow 20-30 minutes. Add 15 minutes if you wish to also tour the Beehive mine site. 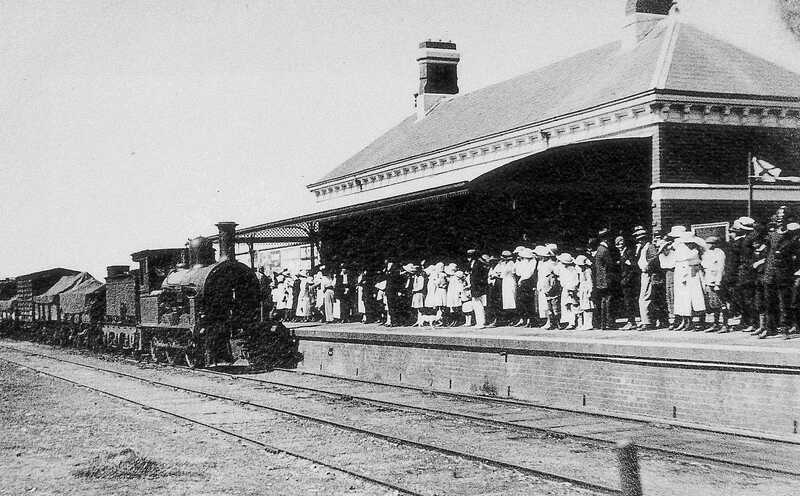 Although the main Melbourne line arrived in Castlemaine in 1862, political machinations and some difficulties with the terrain caused a 22 year delay for a branch line to reach Maldon. On opening day, 16 June 1884, a huge celebration marked the occasion; the local children reportedly consumed 2,700 buns at the celebratory picnic and Maldon travellers were no longer limited to the speed of a galloping horse. 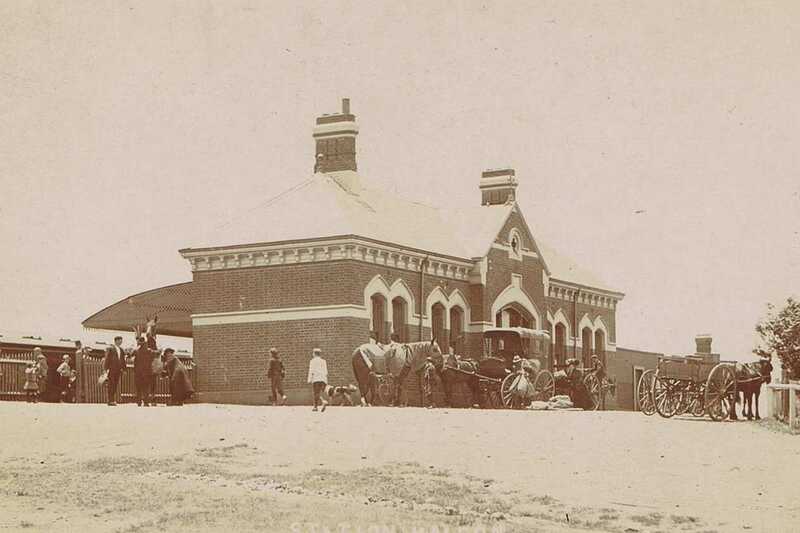 The station building was constructed in 1888. Its Gothic arched windows, clustered chimney stacks and quatrefoil motifs represented of a new style of station design, now known as the 'Maldon' style. 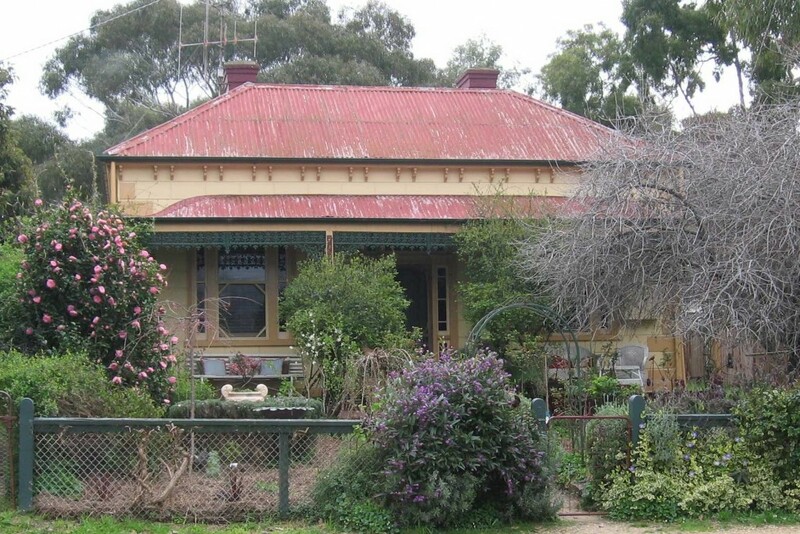 It is the only one in this style to be built outside of metropolitan Melbourne. C1890 the railway now provided a vital link for passengers and freight. It was no longer necessary to battle unmade roads, and travel became a leisure option for many. Originally the benefits had not been recognised by all. From 1861 to 1875 no progress had been made towards building the railway as local traders objected to contributing to survey costs. 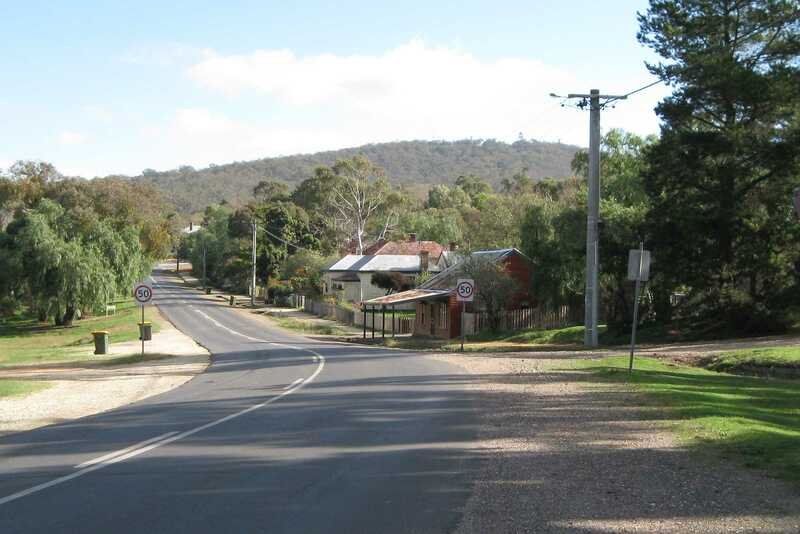 Finally the town voted in favour despite strong opposition from those who felt 'they would lose profit if travel to Castlemaine was facilitated'. It was now possible for large groups to travel together and travel they did both to and from Maldon. This eager group, c1910 has all eyes on the incoming train. The working station with all the paraphernalia required to keep it running, c1956. The corrugated iron clad Goods Shed building in the foreground dates from 1884, and the turntable and water tower to the right (west side) are reminders of a past era. 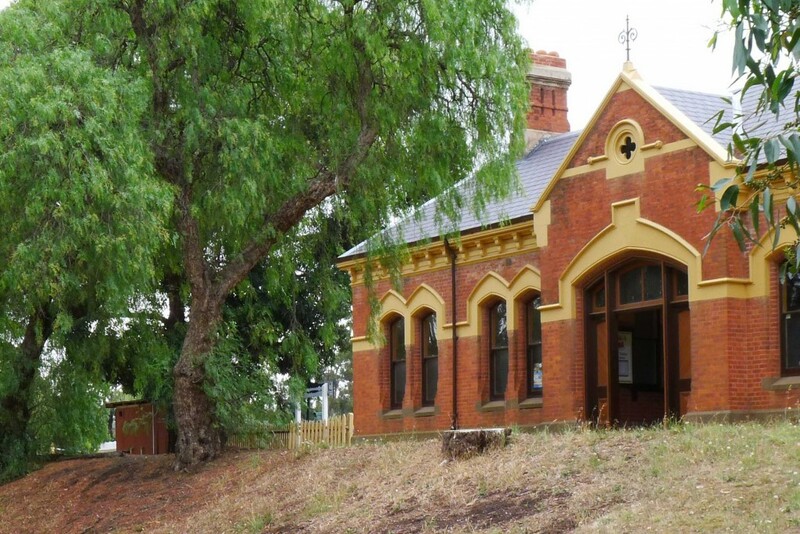 Today the handsome Maldon Railway Station building retains its commanding position in the landscape. It almost came to an untimely end in October 2009 when some of the interior and most of the roof were destroyed by fire. 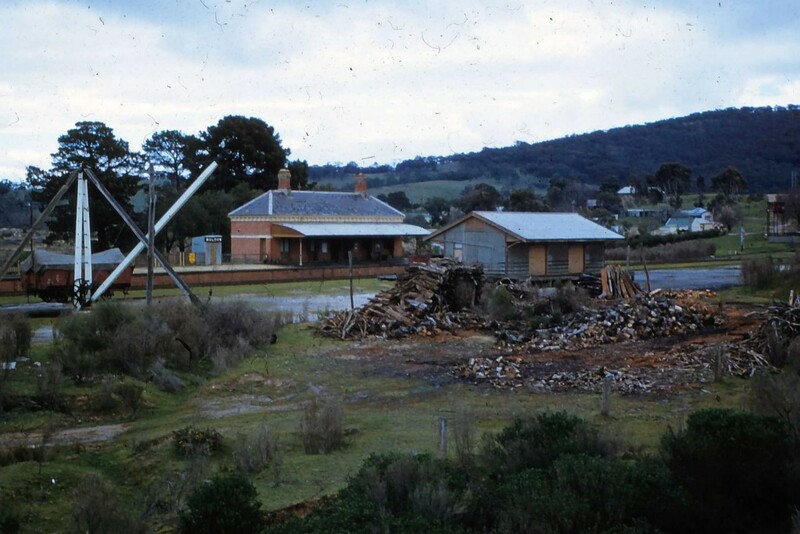 Fortunately VicTrack committed to funding full restoration and operations returned to normal in 2011. As you leave the Railway Station precinct take a moment to enjoy the view west along Hornsby Street to Mount Tarrengower on the horizon. 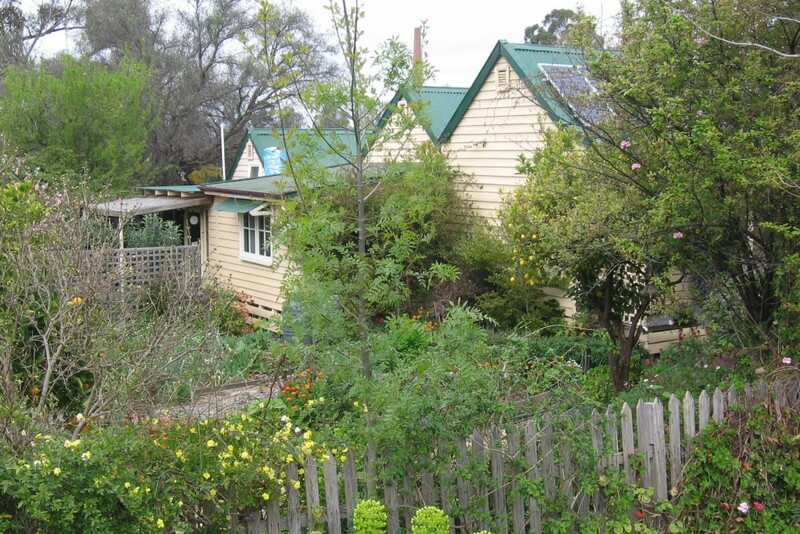 Here the simple cottages and their delightful gardens form a typical Maldon streetscape set amid mining landscapes and against a backdrop of natural beauty. Maldon is indeed a lovely town. Before proceeding pause and imagine it is 1884, the majestic pine trees behind you are still saplings, horse-drawn vehicles make their way along the Bendigo road, and all around the din and dust of mining operations fills the air. The view looking west from the station entrance road in 2016. It's barely changed in 60 years. The view from the station entrance road looking west to the Reef Street intersection c1957. 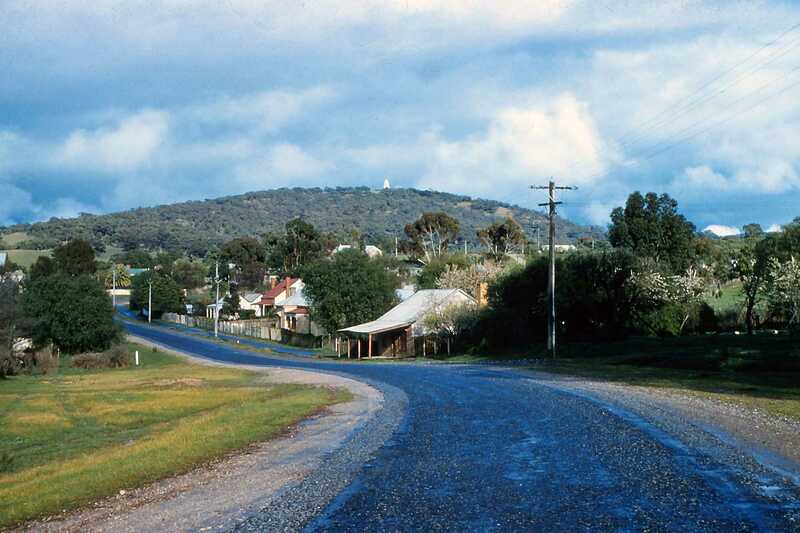 Settlement of this area of Maldon dates back to the early mining days. Rudimentary cottages sat amid the mine sites and alongside roadways, some were even on roadways. By the 1860s roads were better delineated and more permanent housing options appeared. 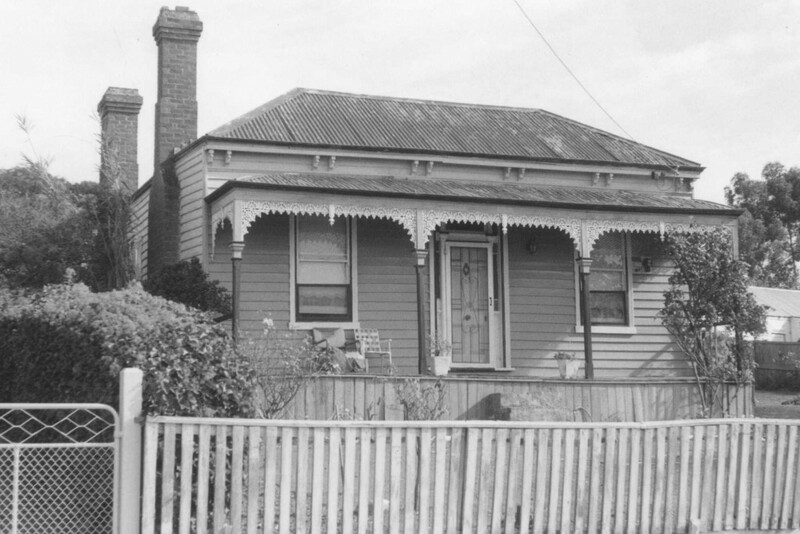 Houses typically included weatherboard cladding (80% in 1869), brick chimneys and the ubiquitous verandah. 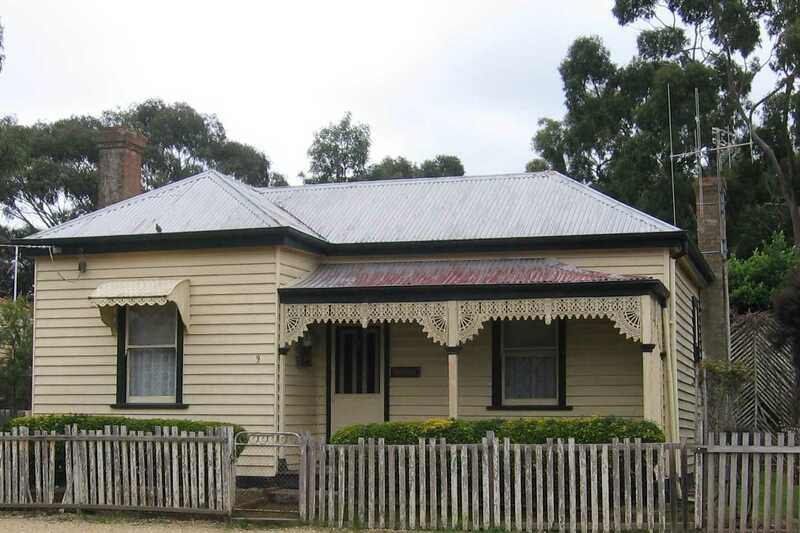 Housing forms ranged from simple gable-roofed miners' cottages, often constructed by their owners, to more elaborate mid-Victorian residences, and each was typically surrounded by a relatively large allotment. 11 Hornsby Street c2016. 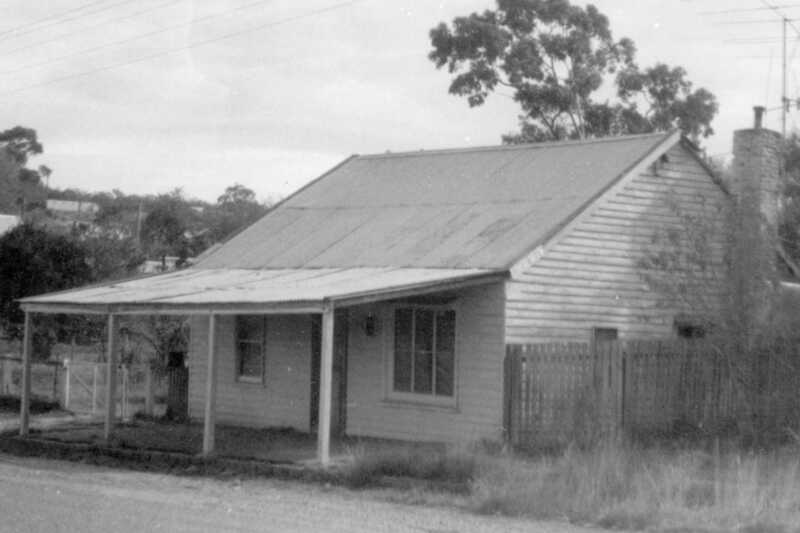 This small building was a fruit shop in the early 20th century. 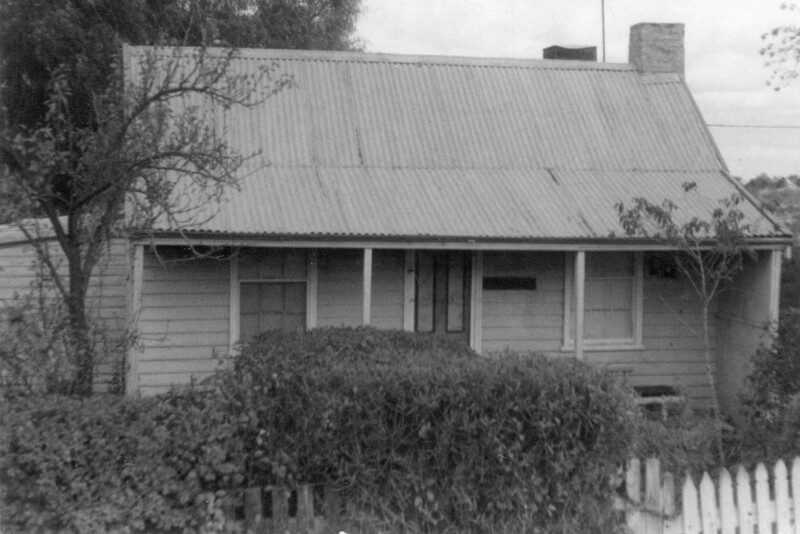 Reportedly the local children amused themselves by taking a running jump to touch the verandah end - this did not always end well and one lad required 7 stitches after becoming caught on barbed wire strung along the edge as a deterrent. This building has been completely restored over the past 2 years. 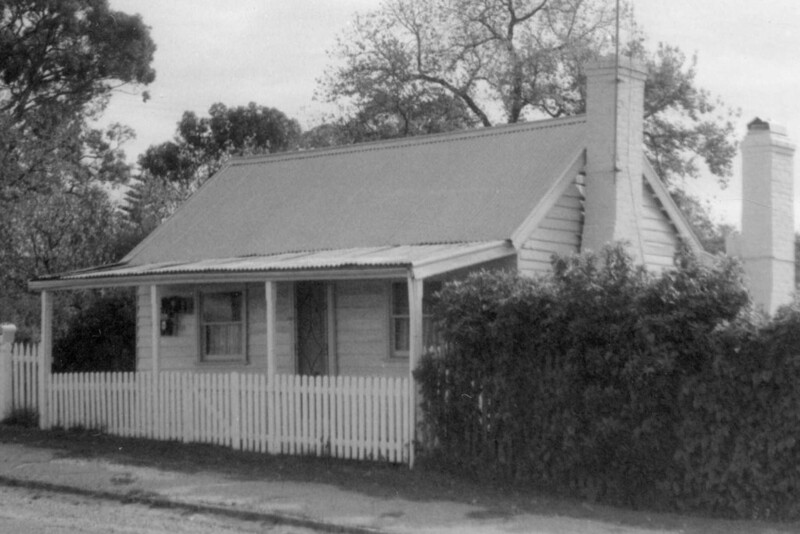 9 Hornsby Street c2014. 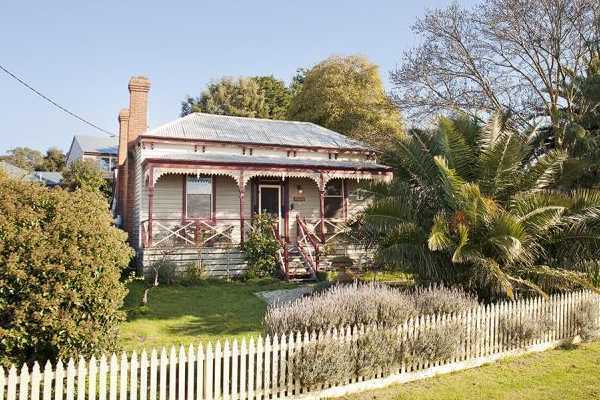 The lots were typically enclosed by picket fencing or hedges and occasionally both together. 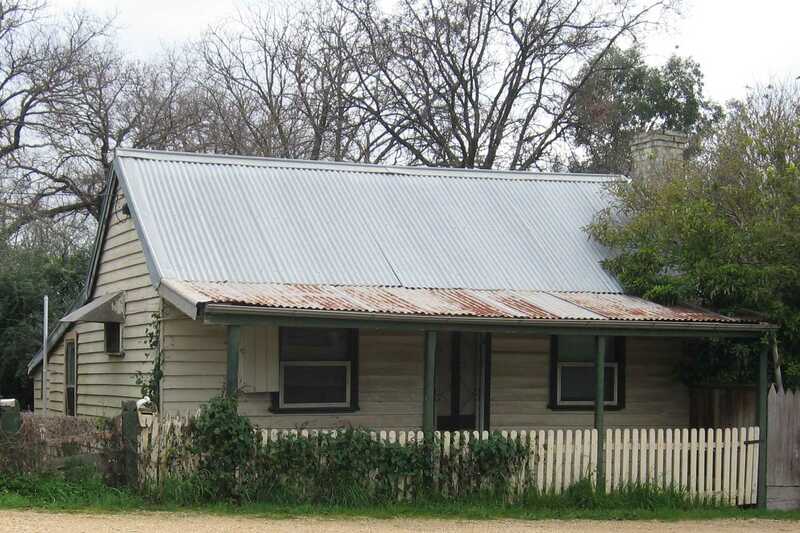 7 Hornsby Street c2014. 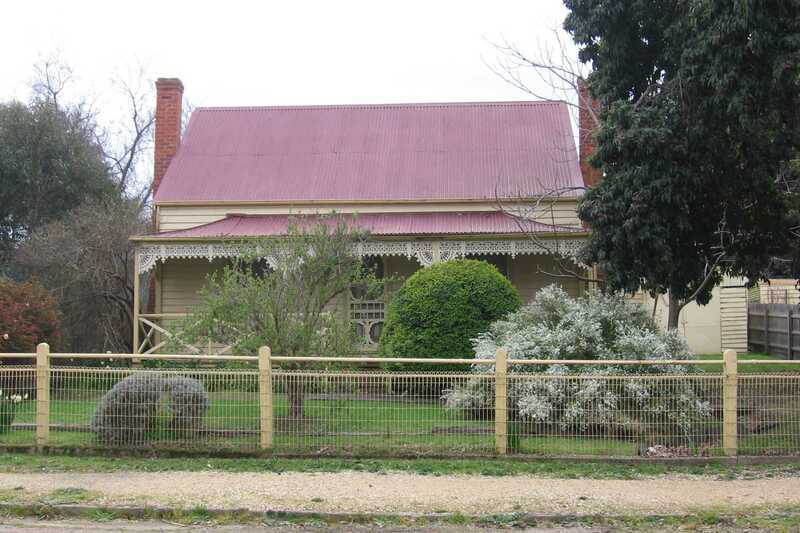 This house and its neighbour are typical of development during the late-1880s and 1890s when Maldon experienced an economic revival. Its owner may have been a professional person, for example a teacher or mine manager, or perhaps a business owner. 5 Hornsby Street c2012. Front gardens may be small however the side and rear spaces were usually commodious enough for food production. 2 Hornsby Street c2012. Many houses have been extended over the decades as families grew and requirements changed. Typically another 2-roomed gable-roofed section was added to extend living space and sometimes a skillion-roofed section was used to bring utility areas under the one roof. 1 Hornsby Street c2012. Most cottages sat on a relatively large allotment by today's standards and their occupants tended to use the space for food production; perhaps fruit, vegetables, a milking cow or beehives. 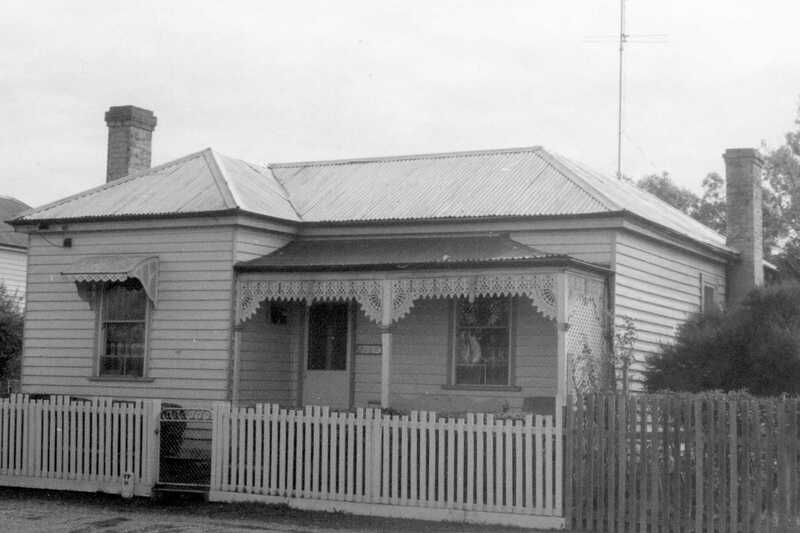 The intersection of Hornsby, Harker and Reef Streets was a traffic hub from the early days. It was literally surrounded by mining operations and from 1884 traffic to the station and goods yard also passed through. The terrain and layout are as challenging today as in the past so take care as you work your way through the intersection. From a safe vantage point soak up the atmosphere. Imagine it is 1866; there are mines 'everywhere', numerous hotels are located nearby, roadways are dirt tracks, reticulated water supply and electrification are still decades away. 1 Harker Street c2014. Unusual shaped allotments are common-place in Maldon, the many oddly-angled streets must have been the bane of many a surveyor. 11 Reef Street c2013. 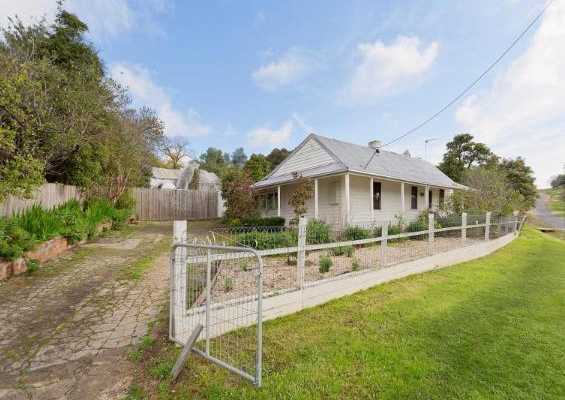 Sitting midway between the station and the town centre this house is typical of development in the late-1880s and 1890s when Maldon experienced an economic revival just as other centres were suffering depressed conditions. Maldon's Beehive Reef was worked from the earliest days, initially as an open cut by private miners and from 1860 by the Beehive Mining Company. This reef was one of Maldon's sensationally rich outcrops and the Beehive mining companies did well for some 40 years. The mine plant was sold by public auction in 1918 but the chimney stack remained. It was purchased by two locals to be kept as a monument to Maldon's pioneers and its gold. If you have time take a walk around the chimney stack and consider what it must have been like 150 years ago - action, noise, dust, danger. Living and working in this environment is hard to comprehend in today's tranquil surrounds. The Beehive Mine site is now a series of archaeological ruins. The chimney stack is the last intact reminder of what was happening here 150 years ago. The top two metres were knocked off by a severe storm in 1923; the damage was finally repaired in the 1980s. 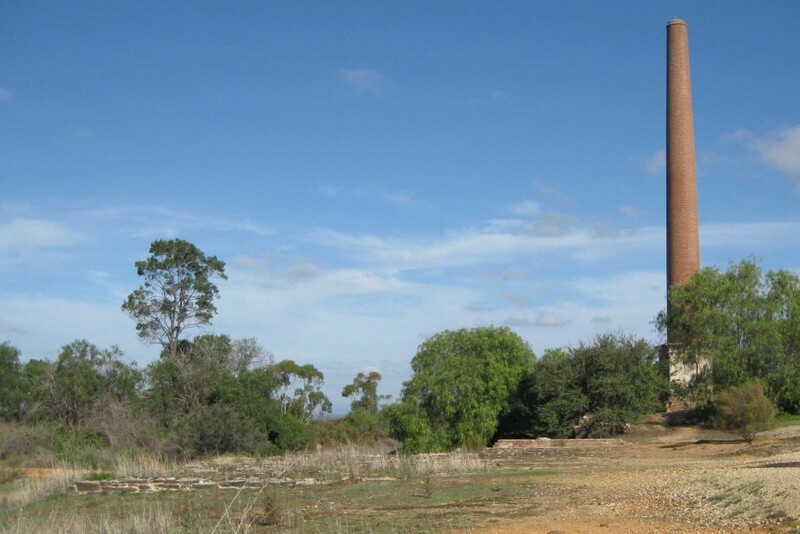 At 30 metres (100 feet) high with a 3 metre (10 feet) square base this chimney is the only one of its age and height surviving on any Victorian goldfield. 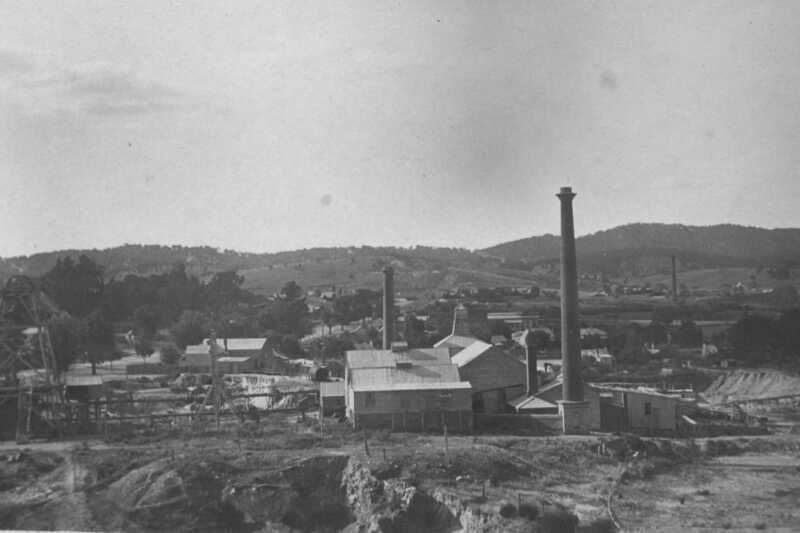 Seen here c1885 the Beehive Company had assembled extensive plant for mining and ore processing on its site overlooking the top of Main Street. The foundations of various winding, pumping and crushing battery engines, and the remains of the chlorination and cyanidation plant introduced in the later years remain visible. 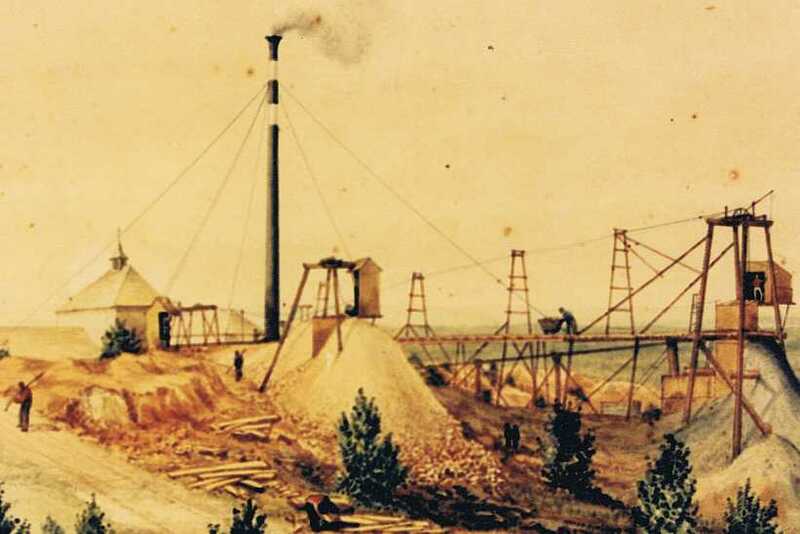 The first Beehive Mining Company plant c1860 described at the time as the most extensive and powerful in the colony. This plant was quickly upgraded as the deeper shafts into the hard Maldon rock required ever more infrastructure and new technology. Scots Church Maldon has taken several built forms since 1860 when the first timber church was erected. Prior to this, services were conducted in the hall of the Royal Hotel in High Street. 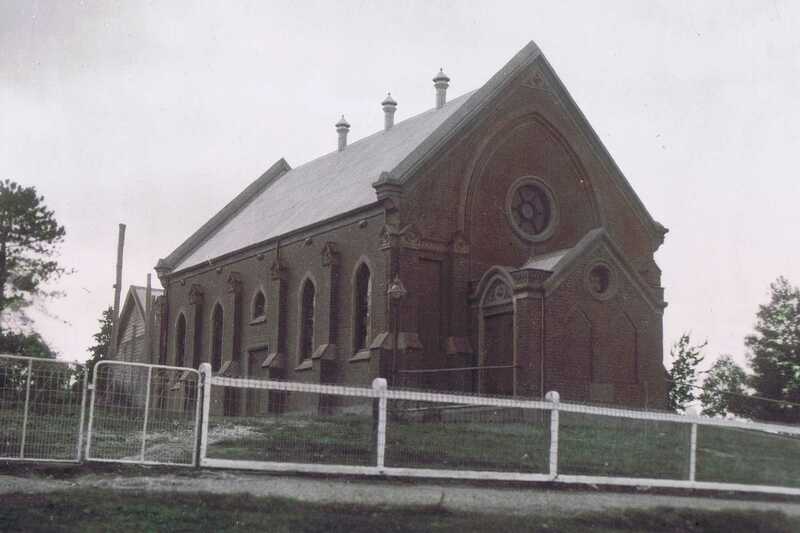 A second timber structure was later replaced by the current well-proportioned brick building in 1905. 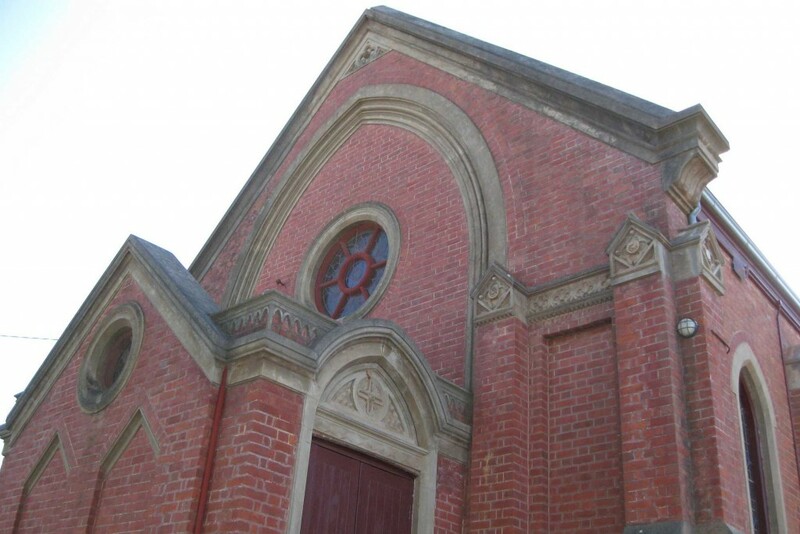 This building was designed by renowned architect Louis Boldini during his time in Maldon. The foundation stone was laid by Mrs Margaret Oswald (widow of Maldon's richest mining magnate). The former Presbyterian church remains on watch over the northern edge of town. Its built features remain intact including its richly coloured memorial windows and a fine wheel window. All fittings have been removed and alterations made to the interior to accommodate its new use. In 1977 most congregations of the Methodist, Presbyterian and Congregational Churches came together to form the Uniting Church. This left Maldon with two surplus church precincts including this one. The old Scots Church sign is a poignant reminder of times past. The Church sits elegantly on its elevated site and its fine detailing is readily appreciated. 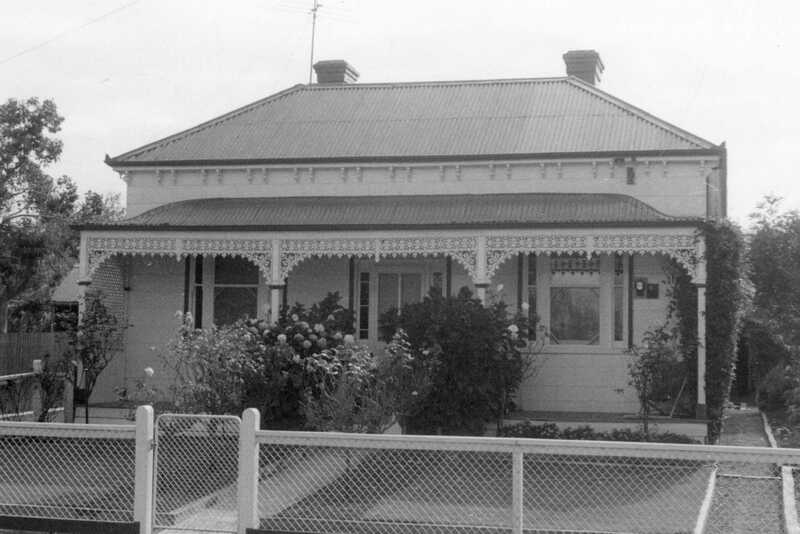 This photograph is c1950 when the site was fenced but otherwise unadorned. 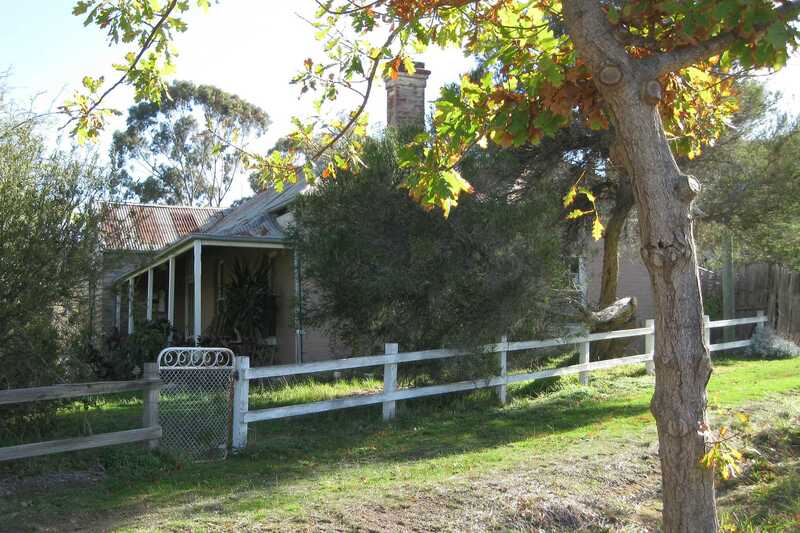 The first building on this site was a two-roomed weatherboard house c1858. It was a 'temporary' residence for the Minister and remarkably parts of it remain today. 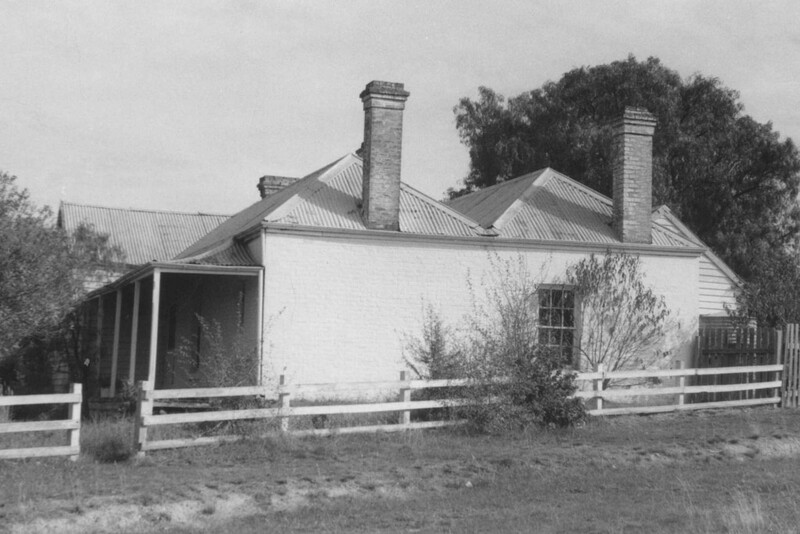 The two hipped roof brick sections of the house were added in 1859 and 1861 respectively. 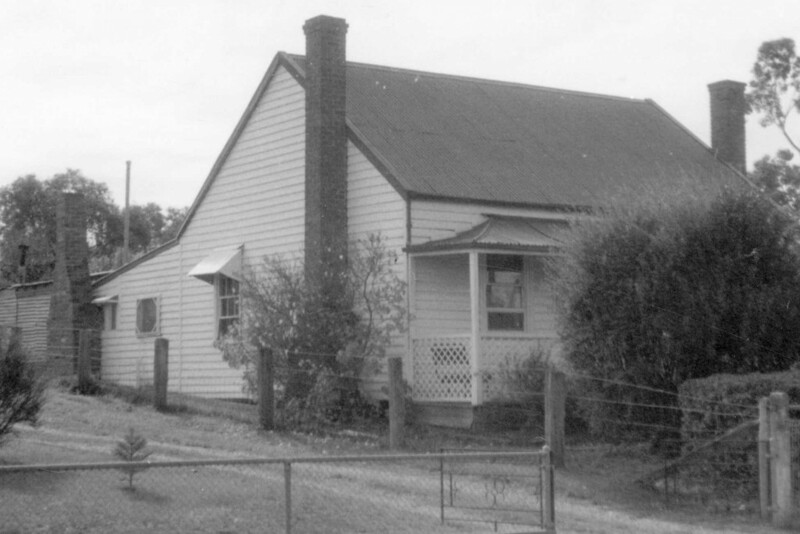 Note the large chimney on the outside of one section, this was common with kitchen fireplaces as it left more room inside and kept some of the heat outside. 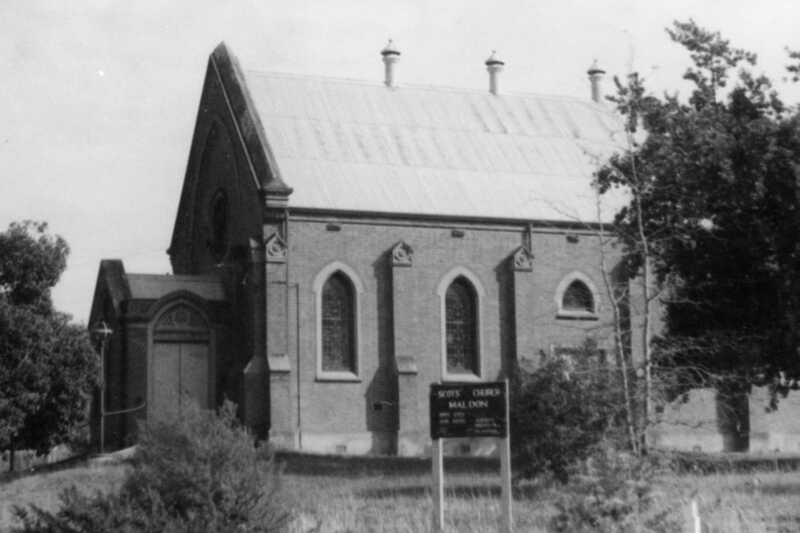 The gabled section on the west was a later addition. This building is significant as a very early church residence which seems to have grown as the Presbyterian congregation prospered. 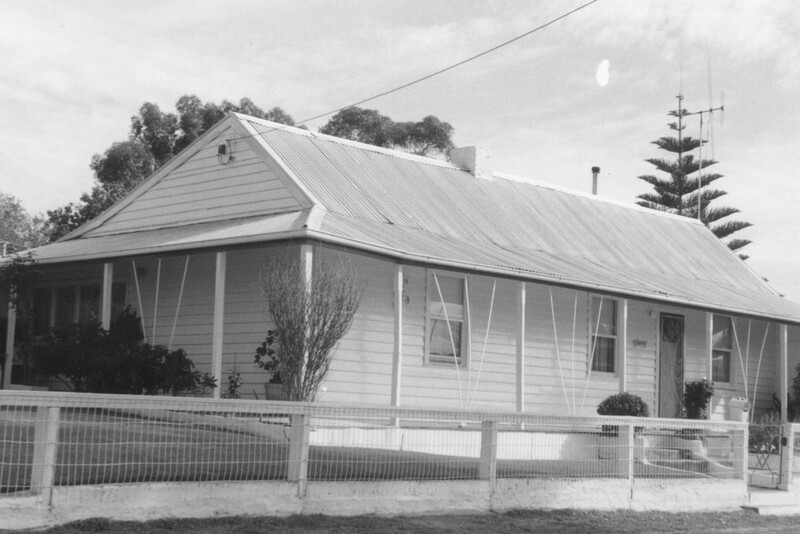 In 2016, almost 160 years since construction commenced, the former Presbyterian Manse remains much as it was in the 1970s. Interestingly the manse was constructed a year before the church, perhaps to encourage a permanent Minister to the area. 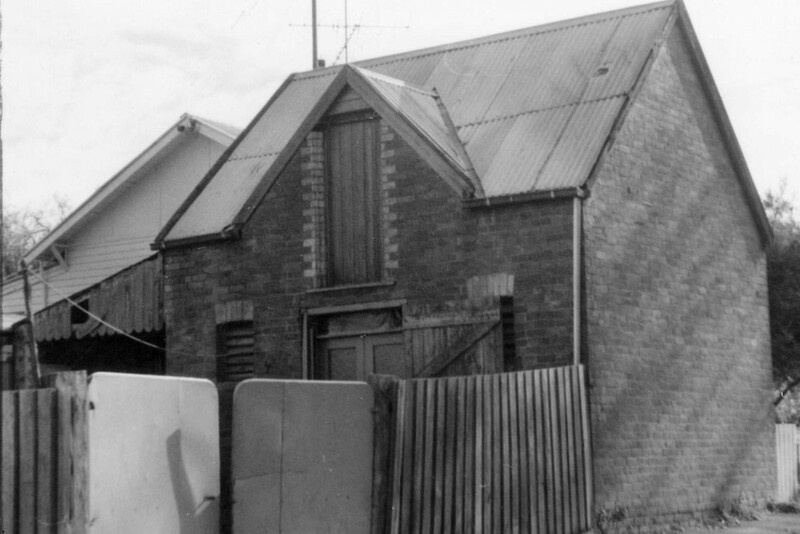 By the 1970s the manse remained intact although it was showing signs of its age and an incompatible fence had been erected. 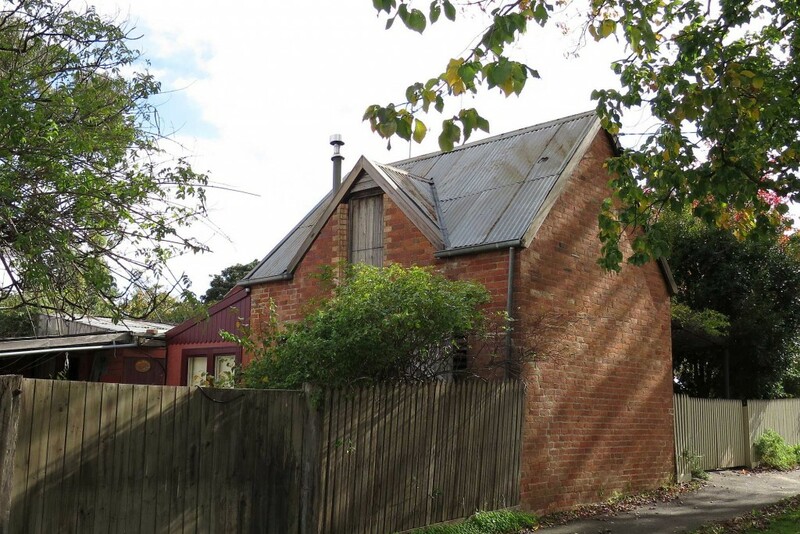 This substantial brick building is believed to have been the stables for the Shire Arms Hotel which was situated on the vacant land next door to the south. The hotel would have been a welcome site for weary travellers as they came in from the Railway Station or Bendigo. The stables building, c1875 includes similar contrasting brick detailing to that found on the former hotel building. Its position on Reef Street adds to the historic character of the area. In 2016 the stables building has been restored and is now used as accommodation. The stables building was rather run down by the 1970s but its pleasant detailing remained evident. 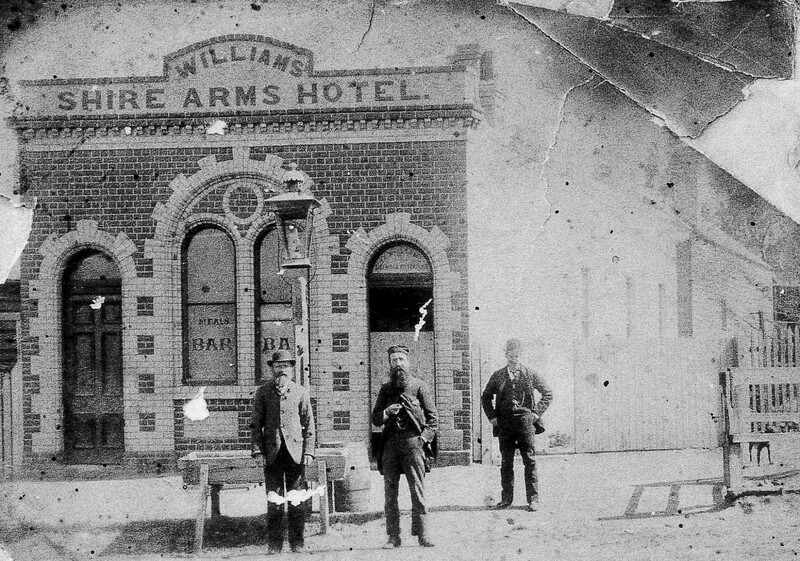 The Shire Arms Hotel was a small brick building likely constructed in the late 1860s or early 1870s given its similarity to the former Dabb's Produce Store and Albion Hotel buildings on the east side of Main Street. The hotel closed in 1910 and the building had been demolished by 1936. 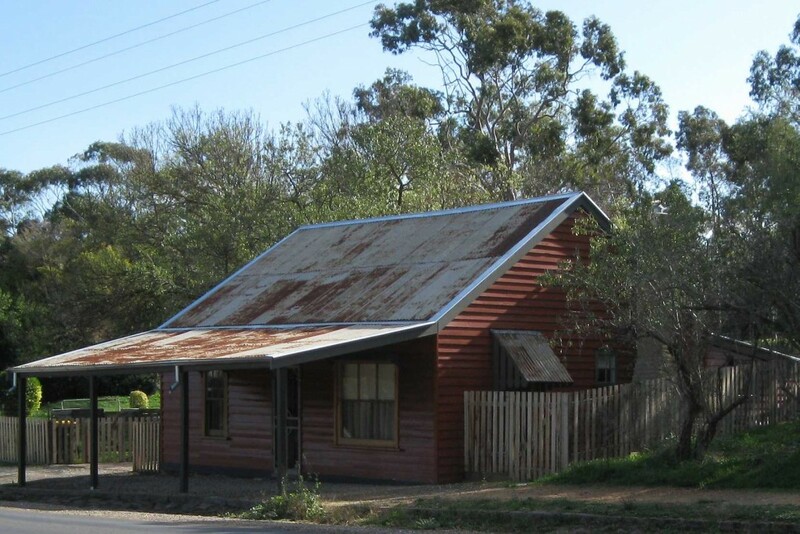 To tour the historic business precinct join the Historic Heart tour at Scotch Pie House.